On what seemed to be a normal evening in January 1994 in Los Angeles California, something very odd happened to Dr. Eric Pearl. It was a Thursday night, and after having gone to sleep, Dr. Pearl was suddenly awakened by a bright light. When he opened his eyes, he could see that the bedside lamp had been turned on, and not by him! Fully awakened by the light, Dr. Pearl sensed that he was not alone. He truly believed that someone had entered his home with intentions that were probably not good. He described this feeling as being very eerie, so he grabbed a knife, a can of pepper spray and his dog, a Doberman pinscher. They carefully inspected every room of the house for a full 20 minutes, but found nothing out of order. Dr. Pearl went back to sleep thinking the sensation must have been his imagination. After twelve years of practicing Chiropractics, no patients had ever said such a thing to him. Other patients that same day reported that they could feel his hands when he was not touching them. He found this difficult to believe, as you can imagine. He asked them to lie there with eyes closed, and he tested the information by holding his hands towards certain parts of their bodies. In every case, they were able to ascertain where his hands were pointing, i.e. left ankle, right shoulder, etc. When they opened their eyes, they reported seeing colors they had never seen before with closed eyes, and smelling fragrances (typically floral) they had never smelled before, and in some cases even seeing and hearing "people" who were not in the room. Dr. Pearl himself did not experience these anomalies, nor did all the patients there that day, only a few of them. Soon after, some patients began reporting healings not attributable to Chiropractic care. For example, some were getting up out of their wheelchairs, regaining use of arms and legs. Vision and hearing improved for some. Others brought in laboratory results showing concrete evidence of cancer growths vanishing. In other cases, children with conditions such as cerebral palsy and epilepsy were restored to normalcy! No longer did they require medication. People began asking, "what did you do?" The problem was, Dr. Pearl did not even know what was happening. He couldn't explain it to himself, let alone anyone else. Thus began a new chapter in the life of Dr. Pearl, with an unexpected turn onto the proverbial fork in the road. This path he was about to embark on would take courage and faith in the unseen, and previously unknown hand of what seemed at the time, the mystical aspects of the universe. Yet we know now that this energy is not just a mystical manifestation of some esoteric aspect of life, it is real and it is detectable and measurable with our current scientific knowledge and instruments. It is still being studied and has been for years. In fact, even though it is not active in everyone, it is available to everyone. 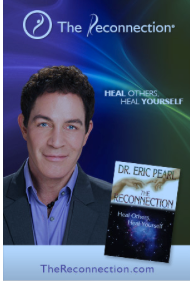 I invite you to put yourself in Dr. Pearl's shoes for just a minute. Here he is, living a comfortable uneventful life in sunny California, doing his noble work helping many people. Then along comes a new opportunity to help even more people in very new and different ways that at the time were impossible to forsee; so he was now facing new choices of moving forward and learning whatever he could about this new energy and using it to help others, or passing it off as a weird experience and pretending it never happened.and going back to the old comfortable life, like slipping into an old soft comfortable shoe. What would you do? Well, you know the story; he did move forward. He pondered it in what I think of as a very spiritual and insightful way. He gave it some serious thought and came up with two worst-case scenarios. In scenario number one, he dies.....and faced with a sort of judgement from the person at the pearly gates, he is told "you led a lot of people down a very foolish path. You have to go back and live your life over again 600 times"
Or in scenario number two, he encounters the person at the pearly gates, and he is told, "we gave you an opportunity to bring about a change of consciousness that woud have ripple effects throughout the universe in perpetuity, and you didn't do it.......because you were afraid. Scenario number two (especially) is the one he could not abide; and so he did move forward. In doing so, he wisely called upon the courage to allow himself to be vulnerable in front of everyone, which inspires people like me. This brings to mind a speech by Theodore Roosevelt entitled, "Citizenship in a Republic", delivered at the Sorbonne in Paris, France on April 23, 1910. "It is not the critic who counts; not the man who points out how the strong man stumbles, or where the doer of deeds could have done better. The credit belongs to the man who is actually in the arena, whose face is marred by dust and sweat and blood; who strives valiantly; who errs, who comes short again and again, because there is no effort without error and shortcoming; ............who at the best knows in the end the triumph of high achievement, and who at the worst, if he fails, at least fails while daring greatly."